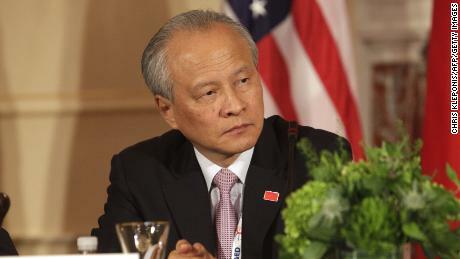 When asked by Fox News host Chris Wallace who Ambassador Cui Tiankai believed in the Trump administration was running trade policy with China, the ambassador replied, "You tell me. ""(Diplomats) don't know who is the final decision maker. Of course, presumably the president would take the final decision, but who is playing what role? 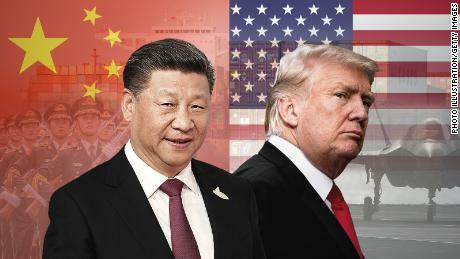 Sometimes it could be very confusing," Cui said in the interview.The interview comes as relations between Beijing and Washington plumbed new lows, following allegations of Chinese interference in US elections and rising military tensions.In an interview with Fox News Sunday, Cui said prominent allegations by US President Donald Trump that Beijing was attempting to sway the 2018 US midterm elections were "groundless. ""One of the fundamental principles in China's foreign policy is no interference in the internal affairs of other countries. And we have been consistent in this position," Cui said in the interview.Chinese officials in Beijing have been growing increasingly concerned by the harsh rhetoric coming out of Washington, which analysts say has caught the Chinese Communist Party off guard.Trump is expected to meet with Chinese President Xi Jinping in Buenos Aires in November for one-on-one talks to broker a solution to the growing diplomatic crisis. The US President's stern language on Beijing has been picked up by a number of other high-profile US officials in the past week, leading experts to question whether this is the beginning of an administration-wide push back against the Chinese government.In a fiery speech in Washington last week, US Vice President Mike Pence doubled down on Trump's accusations of electoral inference by Beijing. "As we speak, Beijing is employing a whole-of-government approach, using political, economic, and military tools, as well as propaganda, to advance its influence and benefit its interests in the United States," Pence said in his speech.Responding to allegations of Chinese state media placing propaganda in US media, Cui said China was "just learning from American media." "This is normal practice for all media," he said.Days after Pence's speech, FBI Director Christopher Wray said China posed a greater danger to the United States than Russia. "China in many ways represents the broadest, most complicated, most long-term counterintelligence threat we face," he said at a US Senate hearing on Wednesday.Orville Schell, director at the New York-based Asia Society's Center on US-China relations, told CNN relations between the two countries were at a "dramatic inflection point. ""I think we'll see more of this … the US really arching its back in response to what it considers an unreciprocal relationship on an unlevel playing field, not just with the economy, but with the media, with civil society, military, business and investment," Schell said. Cui's interview displays the growing frustration and concern by Chinese officials as they attempt to calm diplomatic relations with Washington and the Trump administration. "We don't want a trade war with any other country including the US … (Look) how much benefit American consumers have got over the years, and how much money American companies have made from the operation in China," he said.Days before imposing tariffs on $200 billion worth of Chinese goods, Trump threatened to slap further measures on another $267 billion in goods "depending on what happens. "One line often heard from Chinese officials about the US President is: "What does he really want? "China isn't the first country to be left in the dark by the unpredictable Trump administration's diplomatic policy. In 2017, at the high of tensions between Washington and Pyongyang, North Korea turned to Republican analysts to try and understand the US President's tactics.When asked about frosty talks with Secretary of State Mike Pompeo in Beijing last week, Cui said the talks had been "very timely" and stressed the importance of high level communication. "(But) I think it's a legitimate right of every country to defend its national interests and China is no exception," he said. CNN's Steven Jiang contributed to this article.